I first read this book over forty years ago. I became a fan almost instantly, from the time I picked the book off a spinner rack, read the back cover, and thought this sounds good. Haven’t missed a book since. His name was Remo is arguably the best known chapter opening in adventure fiction. It introduces the title character(despite what Chiun might think) in every entry of the long running Destroyer series. Consistently excellent from the beginning, the books reflect whatever period they first appeared, a humorous look satirically skewering pretentious folks in all walks of life. Oh, there have been a few missteps along the way. Books 108-110 were by writers unfamiliar with the character other than a general look and 134-145 were an inexcorable mess disavowed by the creators. But after Murphy & Sapir, Will Murray and James Mullaney did some very fine novels. New writers, notably Donna Courtois and Gerald Welch, are pushing the Sinanju universe forward to new heights. Remo and Chiun and their world look secure. CREATED THE DESTROYER gives us Remo’s beginning and how he ended up with CURE, his early training with Chiun, long before they thought of each other as Little Father and pale piece of pig’s ear(but affectionately). We meet Smith, the lemony faced man who heads up the secret organization that protects the Constitution by whatever means necessary. And one character I was always sorry to see leave so early: Conn MacCleary, the one handed man(a hook replacing the missing piece) who first recruited Remo. 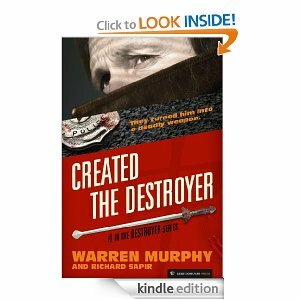 If one has’t read THE DESTROYER, the first book is a good place to start. If you have, get reacquainted with his beginning. Available here. I’ve read it, of course, although it wasn’t the first one I found. I certainly went back quickly to get it and it wasn’t a disappointment for sure. Supposed to be a new movie coming. So I’ve heard. Hope it’s better than the last one. Awesome. I loved these books, used to have 1-50 or so. Wish I still had them. Thanks for the download link, Randy! Also, Created is free right now on Amazon, I don’t know for how long. I love that trailer they did. I just wish the Hollywood producers who’ve optioned the movie would get going on it. And thanks for the kind words, Randy. I promise I’ll do my best.